You’ve been hauling your kids up and down the streets of Amsterdam all day, drawing straws with your husband for whose turn it is to push the toddler in the stroller and who gets to carry the 4-month-old in the Tula. You stop in at the NEMO Science Museum to give the toddler a chance to run around and your back some much needed rest. After watching your husband and toddler run off to the electricity exhibit, you head up to the museum café for a cup of coffee, an obscenely large stroopwafel, and a relaxing nursing session with the baby. But then as you unclip the Tula and get ready to snuggle up with the bub, you catch a glimpse of your baby’s normally pink, pudgy legs…and see that they are covered with giant, purple bruises. a. Recoil and nearly drop the baby? c. Frantically Google nearby hospitals on your phone, roaming data charges be damned? d. Run around the museum desperately looking for your husband, while trying to ignore the fact that no fewer than 50 Dutch families are staring at you in utter bewilderment? 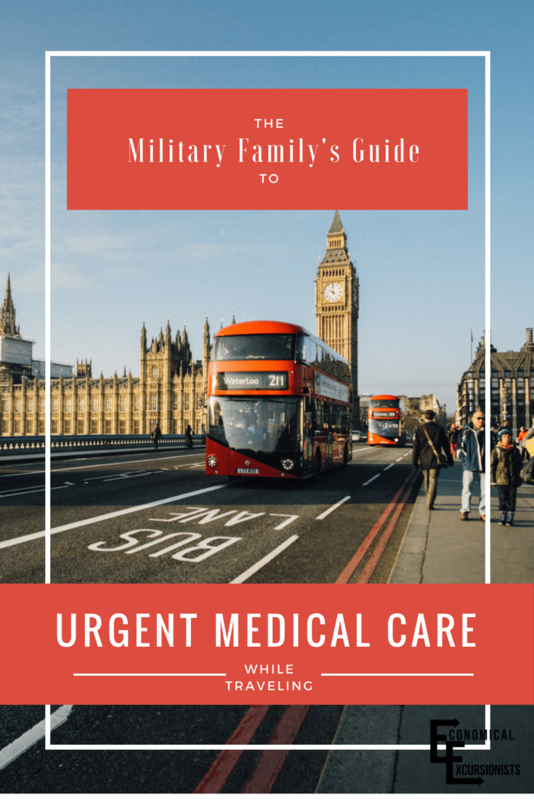 If it’s not obvious, this totally happened to us, and I totally chose option E.
This turned out to be the first of a long list of medical emergencies we had while traveling this past year, so I thought it would be helpful to talk through how to use Tricare while traveling. So read on, dear friend, for a list of lessons learned in the event that you, God forbid, find yourself in need of emergency care while you’re out and about. If you’re abroad and you find yourself in a situation where minutes could mean the loss of life, limb, or eyesight, dial the local emergency number, get yourself to a first responder, and worry about insurance later. 112 is the standard emergency number in EU countries, as well as many other countries in Europe, but definitely look up the local number before you head out on a big trip. It’s Tricare’s International SOS, and, should an urgent care situation arise, they will help you locate doctors and hospitals in your area. If you’re near a capital city or a place with a U.S. government presence, there’s a chance that they will find someone who accepts Tricare, so you won’t have to pay for your visit out of pocket. When we were in Ljubljana, Slovenia, Cal woke up screaming one night with a 102-degree fever. Our hotel had a staff doctor who would come to guests’ rooms after hours, but it was going to cost $200. They’ll also get started on your claim, so that if you do end up having to pay an urgent care copay out of pocket, the paperwork is already started and you can rest easy knowing that you will definitely be reimbursed when you get home. Yes, it’s a UK number, and yes, you will be charged international rates for calling. Definitely not ideal. Buuuuut, these people have saved us every single time we’ve called. The peace of mind of knowing that our $200 in-room doctor visit will be covered by Tricare is well worth the $5 phone call. 3. Plan to always, always, always have your passports on you. If you find yourself in need of medical care, you’re very likely going to be asked for an ID. Don’t count on your military ID or driver’s license being accepted, since they’re not internationally recognized. And if you’re traveling with children, their passports really are the safest bet. When Jem had his little emergency in Amsterdam, we actually didn’t have his passport on us, although Russ and I both had ours. The hospital admitted him anyways after talking on the phone with the Tricare representative, but it’s much better to be safe than sorry. Plus, you never know when you’re going to get stopped at an immigration check, so come up with a good system to keep your IDs handy and secure before you find yourself up a creek without a passport. 4. Research the names of common drugs in your destination’s language. I didn’t realize that Tylenol is not an internationally recognized brand until we desperately needed some for Cal’s fever when we were in Croatia. Though there are two main names for the active ingredient in Tylenol – acetaminophen in the U.S. and a handful of other countries and paracetamol almost everywhere else – there are scores of different brand names that vary even within EU countries. I had to pull out my phone and use my roaming data at the pharmacy when I couldn’t remember the name for Slovenia’s brand of paracetamol (it’s Daleron, FWIW), and once again when we ran out and needed more in Croatia (Efferalgan). Don’t be like me. Save it somewhere safe. 5. Find a pharmacy (not a drug store). Most European countries only sell medications that we Americans consider to be the most basic over-the-counter drugs at the pharmacy, which tend to have much more limited hours than a typical drug store. That’s why these days I try to make sure to at least pack a thermometer, children’s Tylenol, and Pepto Bismol whenever we travel, because, as anyone familiar with Murphy’s law knows, the odds that your child will contract the stomach flu on Christmas Eve are pretty good. 6. Prepare for more language issues. While we’re on the subject of cultural differences and language barriers, do yourself a favor and download the Google Translate app. Make sure you select the option that allows you to save the language of the country you will be visiting so that you can access it OFFLINE (this gives you access even without data). Not only is Google Translate just a great tool to have for your everyday translation needs, especially if you’re already living abroad, but it proved to be invaluable for us on that fateful trip through Slovenia and Croatia. A few days after we saw the doctor at our hotel, Cal’s little bug morphed into a gnarly ear infection. Luckily we were staying across the street from Split’s main hospital, so Russ took him to the ER for some antibiotics. But the hospital was laid out really strangely, and all of the signs were in Croatian. Russ was wandering around the hospital with poor, sick Cal, totally lost. But then he busted out his handy Google Translate app, and it let him take pictures of the signs he couldn’t understand. It then converted the image into plain text and translated the Croatian words into English. Russ found his way to the ER, and Cal got his antibiotic prescription. 7. Save any documents you receive from the medical treatment facility until you return home. When you’re discharged from the hospital or clinic, you should be presented with a summary of the injury/illness as well as the treatment. (If you’re not given one, ask for one.) And if you ended up paying out of pocket, you’ll also get a bill. Keep all of your documentation in a safe place until you return home. You’ll need it when you file your insurance claim with Tricare. I like the TurboScan app for making digital copies. It lets you take an image, and then it automatically cuts out the margins and leaves just the document as a PDF, which you can then email, print, and/or save for your records. But simply taking a picture with your phone works too! 8. When you return home, file your claim. Download and fill out the Tricare claim form. Upload the form, your bill, and any other supporting documents to the claims portal. Sit and wait to be reimbursed. If you don’t want to wait for a check in the mail, you can also set up direct deposit, so your reimbursement will be ready and in your bank account within a few weeks. After running around like a neurotic chicken with my head cut off for a solid ten minutes, I found Russ and Cal. We packed up the kids, and then, I kid you not, we literally ran the 4.8 miles to the ER at Amsterdam’s OLVG hospital. We learned that dear Jem was absolutely fine. What I thought was bruising turned out to be benign swelling in his capillaries, a not-very-common but harmless result of a particularly aggressive cold he’d had about a week earlier. He was never actually in pain and didn’t actually require any real medical intervention. And yet I’m still glad we took him to the ER, because no way could I have done anything else while thinking my sweet baby was, like, hemorrhaging or something. Do you have any crazy urgent care stories from your travels? 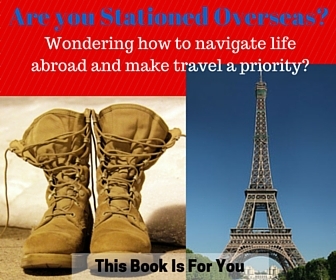 Any advice on using Tricare while traveling abroad? Let us know in in the comments below!